Let's eat with local Lanna cooks with food cooked on site! The meal includes organic vegetables from our gardens. The true Lanna culture and lifestyle will be yours to experience and be cherished for years! Come, join us for lunch! You'll be picked up by our host named "Aoy”! Then, she will take you to visit a local market and continue to her house by local transport, also known as “Rod Song Taew” and "Motor-tricycle" or “Rod Phong.”! Next, we'll visit a local village and organic farm! Then, we'll cook Lanna food together like family! We'll talk & share experiences with Aoy & her family! The food we'll cook is Northern Thai food or Lanna food with a charcoal stove! There are 4 dishes including desserts! For example: Chicken local soup with tamarind, Abb Moo (Minced pork with curry paste wrapped in banana leaves), Sai Aoua (Chiang Mai sausage), Laap Moo Koua (Minced pork salad), and so many more! Have the meal together like a local! The place is in the countryside surrounded by rice fields, orchard, and organic farms! You'll experience the real locals and you will learn something new! See how locals live, share cultures, and eat together! This is the end of the trip! I hope you enjoyed it, and thank you very much for joining me! It is a very unique experience; not a restaurant and not a street stall. 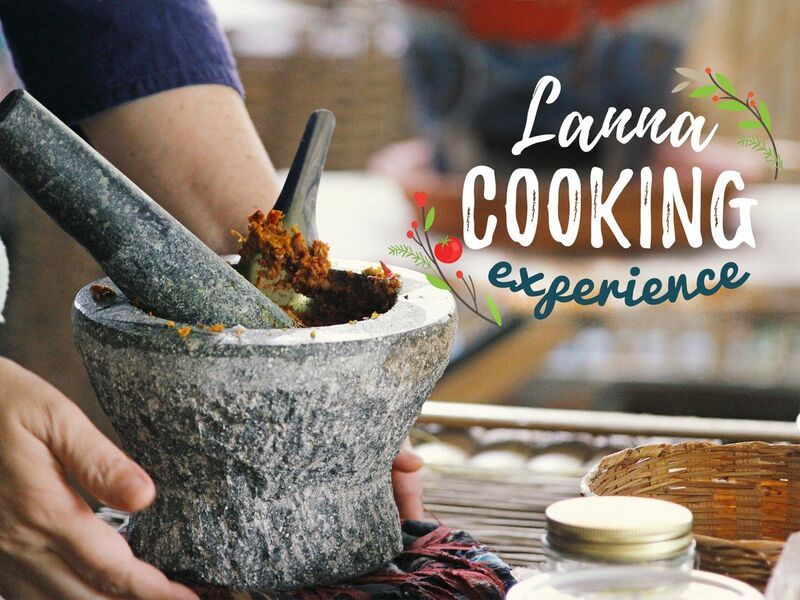 This experience lets you see the preparation of the food, eat the food, talk and visit with the cooks as they prepare your food and later, simply talk as a "Lanna family". including dinner time with locals. There are many thing that can be learned & shared. Lanna food, local transportation, countryside environment, local people. Ingredient for the cooking class. Pick up & Drop off by local transport with in 3 kms. from Chiang Mai City. Excluded : Soft drink/ Alcohol / Souvenir / personal spending. Despite not being good at cooking, my partner and I joined this cooking class with P’ Lin and were surprised how much we enjoyed the class. More so, we were especially surprised that the food we cooked were amazing ... only because P’ Lin is an exceptional teacher ! Initially, we were really worried but P’ Lin assured us that she’ll help us navigate the complex nature of Lanna cuisine. True enough, her familiarity with Northern Thai cuisine and exacting techniques helped us understand the complex processes of Lanna cooking. With her extensive experience and all the attention to detail that entails, we thoroughly enjoyed the market tour – where we learned a lot about local ingredient as well as in P’ Lin’s informative organic farm. She made us feel right at home as we stepped into the cooking class with everything beautifully arranged. Soon it was time for pounding herbs and spices, marinating, frying and simmering. Everything hands on and charcoal cooked in earthen pots. The highlight of course was making our very own sausages (Sai Ua)! Under P’ Lin’s watchful eye and guidance, we nailed it and so can other amateurs. Don't worry, she'll walk you through it all and you'll nail it, too! Trust us, the food was exceptional and you would not want to miss this experience! Authentic and truly a delight to the palette. Very friendly Northern Thai cooking experience! Lin was very friendly and was able to converse fluently in English. Her house and cooking workshop space was amazing and spacious. The food that she taught us to cook was amazing too! Highly recommend this to anyone who enjoy cooking!